A ROW has erupted between Ha-Petlane villagers in Kolo and Reskol mine over the discovery that about 30 corpses of the community’s ancestors were exhumed allegedly without authorisation in May this year. The remains, which were stuffed into plastic bags and taken to a morgue in nearby Tšakholo are set to be reburied on 18 August 2017. What irks the Kolo Area Chief Khosi Michael Bereng the most is that his subjects are divided over the exhumation, with some charging that it was not authorised by community elders and was carried out by another group of village residents in secret. The MNN Centre for investigative Journalism learnt on a recent visit to Kolo that during operations at the mine between 4 and 10 May 2017, Reskol staff accidentally uncovered coffins containing human remains. The corpses were exhumed and taken to the mortuary at Tšakholo, about a 30-minute drive from the mine. The incident had a precedent: In 2009, say mine authorities and villagers, some corpses were controversially exhumed and relocated to a new graveyard at the expense of Angel Diamonds, which operated the mine before Reskol. One of the villagers, 74-year-old Lesole Thulo, argued that the community had not authorised the exhumation, which was done by Reskol and certain village members who he said had “gone rogue”. Mr Thulo said this was the third time the graves of his ancestors had been desecrated by mining companies. He said the 2009 exhumation was forced on the community by the mine with the police and government authorities present. “We were shocked to learn that Reskol has done what Angel Diamonds did in the past,” stated Mr Thulo. Chief Bereng complained that the exhumation violated not only Basotho cultural practices and the country’s laws, “but also moral standards of the community”. Reskol Director Mike Reynolds rejected claims that the exhumation was unauthorised, indicating that the same processes were followed as in 2009. “We did things in consultation with the community committee and chief was also informed. The bodies are being kept in the mortuary at our expense. All these processes are costly to the mine,” he said. ‘Mamahlape Hlapane, chairperson of the community committee that liaises with the mine, also defended the exhumation, saying that it was carried out correctly in consultation with the relevant authorities. Ms Hlapane was one of those present during the exhumation, but said she only witnessed the process, which was carried out by the mine staff. She argued that as its representative, she had a right to represent the community and did not believe it was a mistake not to include all its members in the exhumation process. Materai Petlane, the chief of Ha Petlane, confirmed receiving a report from the mine officers that 17 bags were filled with remains. She had not participated in the process and only learned about it from aggrieved villagers. But she also said her own ancestors had been exhumed and that this should not have happened without consulting her family’s elders. So intense has been the dispute that some village members, including Chief Bereng himself, sought the intervention of the Mafeteng District Administrator Ntsane Mathibeli. 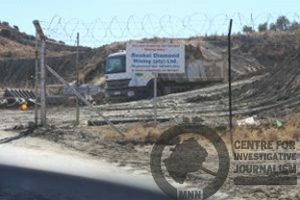 In an interview, Mr Mathibeli expressed worries over “constant” exhumation of bodies by the mine “without a single exhumation of all gravesites and proper re-interment processes observed in line with the families’ traditions”. Mr Mathibeli has since facilitated agreement between all stakeholders on 18 August 2017 as the date for the re-interment of the 30 bodies. Meanwhile, officials of the National Environment Secretariat in the Ministry of Tourism, Environment and Culture, said this week that Reskol management should have consulted their office and the environmental health department at the Health ministry.